Borobudur had been on my wishlist for a very long time. When I was doing Dr. Vidya Dehejia’s course on Buddhist Narratives I saw a lot of images of this Buddhist temple. I saw its relief panels. I saw its geometry. It had entered my wish list to visit one day. To add to this, it is also a UNESCO world heritage site – another reason for it to be on my wish list. So, when I saw it as the first item on the Indonesia itinerary, I could not have been happier. A cherry on the cake was that it was my birthday and I ended up doing two UNESCO World heritage sites that day – Borobudur and Prambanan temple complex. We were booked for a sunrise tour of Borobudur. It is the most popular time for visiting the site – both for photography and for the still cool weather that lets you climb the monument rather easily. As soon as the bus parked on the manicured lawns of this most famous monument of Indonesia, even before the crack of dawn, I had goosebumps. That feeling when you have dreamt of being at a place and you when you really step in it is difficult to define. We entered the Borobudur Temple compounds through the reception taking our tickets. It costs about USD 20-25. It was still very dark and we were each handed a torch to help us navigate the path. My first view of the temple was in silhouettes. As I started climbing its steep steps, images of Buddha started appearing. This gave way to small stupas encasing the Buddha statues. Eventually, the central big stupa stood before my eyes. It was a cloudy misty day – all the structures and sculptures around me appeared shrouded in mystery. It seemed that the rays of the sun will slowly open their folds and let the stories stumble out. They will then talk about the 1200 years that these stones have seen. I walked around the main central stupa. Till the sun woke up, it was a surreal place with silhouettes creating bizarre patterns. As some light began to lighten up the temple, I started walking around. I tried to walk as a monk would have after saying his prayers. I started walking clockwise covering every stupa and every layer of the temple as I walked down. Borobudur is Indonesia’s biggest tourist attraction. I looked at the next layer of stupas with small openings. There is a Buddha idol inside each of them, mostly in Dharam Chakra Parivartan mudra – that depicts the setting the wheel of dharma in motion. It signifies his first sermon at Sarnath, near Varanasi. Unfortunately, most Buddha idols are headless. Buddha’s heads are a prized possession. All these heads are spread across the world in museums or private collections. Each of these stupas has a lotus base. The geometry and symmetry of stupas baffle you. You wonder how the architects and builders of this gigantic monument even imagined such a structure The whole structure is built by interlocking the stones – no mortar or nails have been used. At some levels of the temple when you walk, you can see through the gaps between some of the stones. Loose stones made me miss a heartbeat. After the stupas at the top 3 levels, the temple had circumambulation paths at bottom 6 levels. I took a parikrama or circumambulation at each of them. As you walk, both sides of the walls around you have sculpted wall panels. They talk about the life of Buddha and Bodhisattvas. I could identify very few scenes from Buddha’s life. The relief sculptures are not in very good shape. There are mismatched panels that must have got misplaced during restoration. After all, Borobudur stayed in oblivion and covered with volcano ash for many centuries. The arched doorways made in beam and lintel style have Kirtimukhs carved on them. The entrance to each level is guarded by a pair of sitting lions. By the time I reached the base of the temple, the sun was shining brightly. When I tried to capture the whole of the temple in my camera, I had to walk quite some distance to get it in one frame. This is when I realized the enormous size of the temple. Its layers are almost like a lotus flower, half covering, and half revealing the layer beneath it. The tall stupas look like bells kept on top. I wondered, how they managed to get so much stone in one place? I silently admired the architectural genius of architects and builders. The world knows Borobudur as a center of Mahayana Buddhism. To me, standing before this, this was a surviving example of highly evolved aesthetics, that merge science and art in such a way that it appeals to every sense of yours. It has the power to make the stone talk to you. Borobudur Temple is the largest known Buddhist temple in the world. Borobudur comes from two words – Boro means big and Budur refers to Buddha, so it essentially means Big Buddha. Budur is also a word for mountain in Javanese – no wonder the monument looks like a huge mountain. Some scholars think Boro is the distortion of Sanskrit Vihara – a word used for Buddhist monasteries. I do not recall any monasteries around or any mention in any literature anywhere. It is located between two volcanoes and two rivers – making it a part of the extremely fertile land. Gunadharma is said to be the architect of Borobudur temple, but nothing more about is known about him. Temple consists of 9 platforms stacked together. The bottom 6 platforms are square while the top 3 are circular. The Central dome is surrounded by 72 smaller stupas with perforated domes at upper 3 levels. Bhumi-Sparsha Mudra – touching the earth mudra that represents the time Buddha attained enlightenment. Varada Mudra – the giving position – when Buddha is blessing or giving something. Abhaya Mudra – the fearless position – when he is protecting you or giving you assurance. Dhyan Mudra – meditation position – when he is meditating. Dharam Chakra Parivartan Mudra – when he set the wheel of Dharma in motion – represents the time he gave his first sermon in Sarnath. Vitarka Mudra – when he is presenting an argument – a teacher’s task to present a counter view. Kamadhatu or the level of desires which refers to worldly existence. Panels at this level tell Jatakas or the stories of Bodhisattvas. These stories represent the earlier lives of Buddha. Rupadhatu or the world of forms where we start looking inward but through the forms which are represented by idols or storytelling panels. This is like the Saguna stage of Hinduism. The panels at this level tell the story of Buddha with important scenes from his life journey. Arupadhatu or the formless divine for the seekers who no longer need visual aids to look inside. This is parallel to Nirguna philosophy like the one followed by poets like Kabir. At this stage no form is required, so no sculpted panels. The walls and the inner sides of balustrades have story panels. The carvings on stone give you a glimpse of the time when the temple was built. What is interesting is that most human figures are in Tribhanga i.e. the body is bent in three parts. You can observe the dresses, the hairstyles, the headgear and the animals in use. There are everyday scenes that depict the life of a common man. There are scenes from the life of Buddha that depict the places he lived in, the horse he left on, Bodhi tree under which he meditated and his descent from Tushita heaven. I also saw symbols of prosperity like Puran Ghatak or the overflowing pot. There are 2600+ bas-relief sculptures in the whole of Borobudur temple. These panels were probably painted in bright colors, as was the case with ancient caves like Ellora in India. Read this post on how to interpret Buddhist narratives. Viewed from the top, Borobudur looks like one single stupa. The geometric design can be interpreted as resembling a Buddhist mandala or Hindu Shri Yantra. It can also be looked like a stepped pyramid. Incidentally, the structure follows a uniform ratio of 4:6:9 throughout the rising pyramid. It was also found that the basic unit of measurement is Tala – that is roughly the length of the human face or the length of the extent of an extended hand. In Hindi / Punjabi, this is called Gith. Even though it varies for every person, it can be quite a uniform measure. Was there a Borobudur Lake? There is a conjecture that Borobudur once stood in the middle of a lake, It appeared to float in the lake. However, the current research concludes that there was probably a lake close by when it was built and in its initial days of existence, but probably temple never floated in a lake. Apparently, the real foot of the temple is hidden below the stone encasement. Some say it is because the Vaastu is bad, while others say it is to provide extra support to the structure. The stone for the monument came from neighboring stone quarries. The bas-reliefs were sculpted in-situ. Artistically designed corner Makar or crocodile shaped openings are a part of the integrated drainage system that does not let any water stay on the monument. It is supposed to be a part of three temples all of which were built in a straight line. Other two temples being Pawon & Mendut. Borobudur temple was built around 800 CE making it over 1200 years old. Sailendra dynasty was ruling Java under the Srivijaya empire when it was built. Not much is known about its construction or the purpose for which it was built. It is estimated that it took 75 years or so to build it. It was probably abandoned around 14th CE when Hindu kingdom gave way to Islam. Some sources say it was abandoned much earlier. Both the reason & the time of its abandonment are uncertain. However, all we know is that it stayed under layers of volcanic ash and jungle growth. The impact can be seen on its bas-reliefs on walls and balustrades. Much like our own Ajanta caves, Borobudur was rediscovered in 1814 CE by an Englishman – Thomas Stamford Raffles. Raffles was the then British ruler of Java. It took about 20 years to completely unearth the monument. Since the discovery, efforts were made to restore it. Major efforts were done in late 20th CE just before it was declared a UNESCO world heritage site. After restoration, it has again become a popular pilgrimage for the followers of Mahayana Buddhism. Incidentally, the name is also credited to Raffles even though there is evidence of the name being used in some ancient court records of the Majapahit era during 14th CE. Re-discovery of Borobudur while brought back the wonder to us, it also invited people who pilfered the precious artifacts. Most of the Buddha’s heads were severed from Buddha idols and sold. I wonder if it was because Buddha’s heads are considered precious spiritually or financially. Or, was it just easy to smuggle the head instead of the whole body. If there was an image of Buddha inside the central Stupa – no one knows. Similarly, the Chhatra or the parasol on top was dismantled and is kept in a museum now. No one knows how the original Chhatra looked like. For more details on re-discovery of Borobudur read this Wikipedia page. Borobudur – Temple or Stupa ? It was debated if Borobudur is a Stupa or a Temple? The conclusion was that it is a temple – a place of worship or rather a place of pilgrimage. During the time it was lost to the world, the stories and legends associated with it continued to live. People believed it to be a harbinger of bad luck. There are many theories about how these stories came up. In Asia, any abandoned monument gets associated with bad luck – otherwise, why would such magnificent structures be abandoned. In a strange coincidence, it remained intact when a major earthquake hit Java. Buddha Purnima called Vesak in Indonesia is still celebrated with great fervor. At the time of writing, the ticket for Borobudur is IDR 400,000 which is roughly INR 2000/-. Ticket includes a small souvenir and a coffee. Sunrise is the best time to visit Borobudur although this essentially means no sleep the previous night. Temple is roughly 40 km from the city of Yogyakarta at Magelang. Carry a bottle of water. You would need a lot of water and there is none available at the monument, till you come back to the reception/restaurant area. Weather is hot and humid even in the morning. Guides are available at the top, I did not engage one. Prices are negotiable. Manohara restaurant/coffee shop at the reception is a good option for food/coffee. The Souvenir shop is small but a lot of souvenir vendors will start following you as soon as you come down the monument. They can be pushy but a No with a smile works. It is a must-see for heritage enthusiasts, and for first-time visitors to Indonesia. 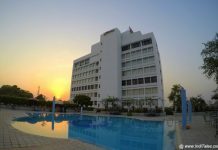 Recommend you read following travel blog on my Indonesia tour. Next articleInternational Travel Checklist – What To Pack? Hmm…interesting. Could it have bad luck? I wonder if there are other indications of it. That’s something new today. Nice write up Anu, I learn a thing or two. I guess when a monument, just like humans goes through low phases, everything associated with it goes bad. And when the fortunes turn, so do the stories. Borobudur was a dream come true Mumun. now as buddhist powerful meditator and enthusiast. yr. taste of livin a gr8 life is remarkable. Very interesting information Anu. Haven’t heard of such things before.Indonesia is really amazing..Java is an island in Indonesia..(I didn’t knew it) Thank you for sharing..
Kavipriya, Java is one of the 17,000+ islands of Indonesia. Jogja is a cultural hub and a lovely, vibrant place to explore. Glad to know more about Borobudur. Lovely post. Happy that you learnt something new about Borobudur. It is a majestic temple. So beautiful! All Buddhist shrines have an ambience of peace. Thank you for sharing Anuradha. Wonderful read! That first picture of Buddha in silhouette is stunning – He looks so alive and real and surreal at the same time. Wonderful post, Anuradha. Indonesia, particularly Borobudur and Prambanan, have beenn on my list of places to travel to ever since a friend spoke about the trip to me. Hope to visit them both one day. Thanks for sharing and tagging me. Sudha, I was supposed to do only Borobudur as per the itinerary. A follower on twitter insisted that I visit Prambanan and it somehow worked out. I want to go back to Yogyakarta once again and explore it in detail. It is such a cultural hub. Anu, I love this post! You’ve written beautifully, makes me even want to go back to Borobudur and pay more attention to every detail you’ve mentioned here! Thank you! Terima kasih! Gio, am so glad that you enjoyed the post. I am sure you would go back to Borobudur many times. 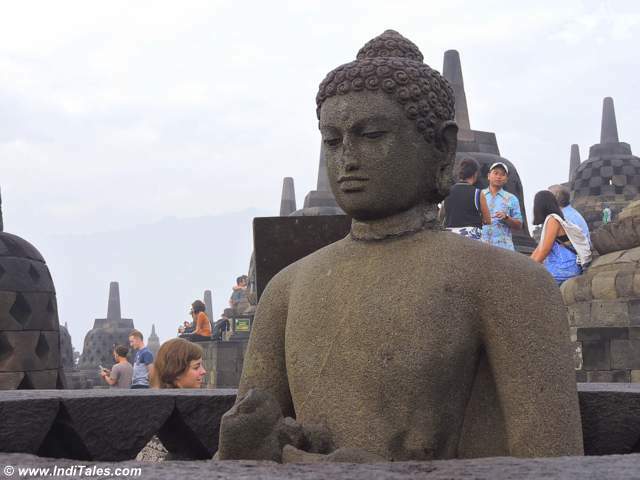 great articles and mind blowing post on Borobudur. i am happy to read about Borobudur. Borobudur comes from two words – Boro means big and Budur refers to Buddha, so it essentially means Big Buddha. Budur is also a word for mountain in Javanese – no wonder the monument looks like a huge mountain. Some scholars think Boro is the distortion of Sanskrit Vihara – a word used for Buddhist monasteries. I do not recall any monasteries around Borobudur or any mention in any literature anywhere. Very nice information with grand pictures !! wonderful place, nice story dear Anuradha ! It is a lovely place Gaurav. Have you been there?